The 2017 FIFA Confederations Cup in Russia will welcome football fans of all nationalities from all over the world – arguably none as colorful and fun-loving as those from Mexico. Mexico will be cheered on by Pancho Villa’s Army, which attends matches to get behind ‘El Tri’, while enjoying music, food, and dancing along the way. RT Sport caught up with one of the group’s leaders, Rich ‘El Coronel’ Guel, to talk fan culture, food, and playing host nation Russia at the tournament. Pancho Villa’s Army was formed in 2013 during a CONCACAF Gold Cup match versus USA when the founder went to a bar in the US to watch a Mexico game and realized that, while there were many American fans, there were few from Mexico. Alarmed at the absence of fans able “to get together and cheer for Mexico,” Pancho Villa’s Army was created as a means of rallying the Mexican football faithful. Now the army comprises 35 ‘battalions’ spanning 14 US states from California to New York, “with more to come.” A 5,000-strong contingent recently marched through Vancouver all the way to the stadium for a World Cup qualifying game in Canada. El Coronel talked to us about the tournaments from the army’s base in Texas in a room that has a drawing of Pancho Villa – the fabled Mexican revolutionary who lends his name to the group – hanging in the back. The words ‘no era penal’ – Spanish for ‘it wasn’t a penalty’ – are scrawled across the flip side. RT: El Coronel, Tell us a little bit about Pancho Villa’s Army. El Coronel: We are probably the only supporters group for the men's national soccer team of Mexico. We started back out in 2013 during one of the Gold Cup games for the CONCACAF against the US. The founder of Pancho Villa’s Army actually went to a bar to watch the game and noticed that there was a lot of American fans, a lot of US fans and there was no Mexico fans, which he thought was kind of strange because Mexico has a huge following not only in Mexico but here (in the US) because of the large number of Mexican Americans, and those with Mexican heritage here in the States. He knew there was a lot more than him, that's where the idea was born to create a supporters group to get together and basically cheer for Mexico. RT: Who is Pancho Villa and what significance does he hold for Mexicans? EC: Pancho Villa was a Mexican revolutionary along with Emiliano Zapata. Villa was from the north and Zapata from the South and during that time they overtook the governing bodies of Mexico which were at that time corrupt and they basically fought for the rights of the peasant people in Mexico to whom they wanted the land returned, just like most revolutions are started to get back the rights and the freedom to its people and that’s pretty much where Pancho Villa’s Army was born because he fought for the people and that’s basically what we’re doing we’re fighting for the Mexican people to get everyone together to watch Mexico games to cheer Mexico. We want to create the entire experience for the football fan. We do similar to most travelling groups, but we pull everyone from different parts of the country. It’s surprising to see how many followers the men’s national football team of Mexico has and I’m assuming that every country respectfully has its followers who travel but with the large amount of Mexican Americans here in the US - people travel. We went to Vancouver for a World Cup qualifying game and the Canadian press estimated about 5,000 Mexicans in Canada marching to the game to watch Mexico. So, you know, we’ll turn out, we’ll turn out in numbers and basically what we do is we kind of try to work on trying to put a travel package on together, excluding the flights because the flights always vary but we try to get discounted hotel rooms or we select a certain hotel in a certain area near the stadium and we say we’re selecting this hotel and if you are a Pancho Villa’s member you can get a discount rate if you book with this particular hotel. Now there’s no kickback whatsoever, but we try to do a lot of the legwork for our fans and that way you know we go and we just enjoy it together as a group. RT: Your former manager Miguel Herrera unwittingly became a star of the last World Cup thanks to his eye-catching celebrations and facial expressions, who do you think will be a star for Mexico in the Confederations Cup? EC: [Laughs] Miguel Herrera was a great motivator, and I think when you go into a big tournament like the world cup you need that motivation you need someone to believe in you and that’s something that he definitely did. The energy that he brought was outstanding because he had that relationship with the players, and it’s like a no-holds-barred, we’re going all in and that kind of was his style and it rubbed off on the players. We had the Netherlands up against the roped. We technically should have won that game, but we made some errors, like any other football game, and it ended up costing us our fifth game in the world cup but we need that kind of motivation and I believe that any football side needs that motivation to keep the players motivated. RT: You will play Russia in the group stage on June 24th at Kazan Arena, how much does it mean to you to play the host nation at the Confederations Cup? EC: The last few World Cups or the Confederations Cups we've had the fortune, in a sense an honor to play the host nation. At the World Cup in South Africa we played South Africa, in Brazil we ended up playing Brazil in the group stage, and then we're gonna definitely play Russia obviously in the Confederations Cup. So, you know, it's exciting you're playing the host nation, it's an honor as well so I'm really really happy that Mexico has been fortunate enough at least at the last major major tournaments to play the host nations. RT: Do you know anything about the Russian team? EC: We don’t, but we do know they got some great looking jerseys. They’ve got this beautiful maroon jersey that they played with at the last World Cup, beautiful, beautiful jerseys. To be honest with you there isn’t anyone we’re looking at per se right now. RT: Recently there has been some bad press about Russian football. Do you pay any attention to this, and does it bother you coming to Russia? EC: Well, you know, I think that it's unfortunate but it happens and it happens all around the world, you know even in Mexico we do have a few bad apples that kind of take the spotlight for the average fan. For the majority, you have a few bad apples that kind of ruin the bunch. But I think that goes in any football side in any country really. I think that typically, historically, you know, Mexico is always almost kind of like a 'fun neighbor', because typical of Mexican culture we enjoy food, we enjoy music, we enjoy dancing, we enjoy, laughing and just kind of enjoying life and I think that tends to rub off. I know that you hear stories through the press - for example hooliganism - and what not but for the majority of it, we don't foresee anything happening you know. We've gone to the World Cup, we've gone to different places and everyone receives us with open arms. Football is what unites us all, it’s the most beautiful game in the world, it unites us all and that's pretty much my take on it. RT: What can we expect from Pancho Villa's Army during the 2017 Confederations Cup in Russia? EC: One big fiesta! Every time Mexico play. Just because it's an experience and I think that's something that Pancho Villa’s Army really dedicates, we dedicate ourselves to trying to create that experience for the football fan to come out and just have a good time. At the end of the day you know, we're watching the sport we love and win or lose - obviously we would much rather win - but we're enjoying what we love. We love to watch football, we love to cheer on our side and even at the end of the day if we're watching the World Cup and it ends up two different countries in the final we're gonna watch it anyways and we're still gonna do a fiesta regardless, whether Mexico's there or not because I think overall the sport is what unites us all. RT: Describe a typical trip to a game for Pancho Villa’s Army. EC: What a typical trip would look like is we get together the night before for those who travel and get out there early. We do a pre-party. We meet up for dinner, and just kind of catch up because once we start meeting each other from different parts of the country, we start to become family so we get together and on the day of the game we do a traditional tailgate where we get together outside of the stadium and we grill food we bring out some beers, some soda and water and we bring out what we call ‘el tamborazo’ or ‘banda’ and that can consist of anything from like a six to ten to twelve band members coming out and just playing freely with trombones and trumpets and tubas and drums, and basically we love to dance, so it become a big party before the game, then we go in and enjoy the game and we usually do like an after party where we get together and we want to continue. That’s pretty much in a nutshell what we do when we travel to these games. RT: Can Mexico win the Confederations Cup? EC: Well I think we can, you know, one thing about Mexico is, when we play the better, higher-ranking teams, Mexico will play up to that level, and that's one thing that they traditionally do, we play up to the level of the competition, and it's unfortunate sometimes when we play someone who's ranked lower on the FIFA ranking, we tend to take it a little bit easy and kind of, you know, let the other team hang around. Whereas if they play some thing like, just to give you an idea, Spain, or even a Germany or Argentina, Mexico will up their game and you know, we are infamously known for doing that - of playing up to the competition. 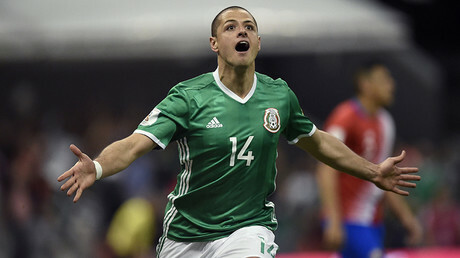 RT: How big a player is your recent all-time top scorer, Javier 'Chicharito' Hernandez for Mexico? EC: He’s a big player huge player, he just scored his one of his last goals, in Los angeles, on Saturday, May 28, which he was tied, or top scorer of all time with Jared Borgetti. They had been tied for quite some time at the national level and he went ahead and scored and now he is the leader, the national leader in goalscorers. But not only that, he obviously has played for Man United, he scored some important goals there, he also went to Real Madrid - he did some excellent work there, and then obviously at Leverkusen right now he's doing his thing obviously like most goalscorers, they go through their little ups and downs but Chicharito he's still young and he still has a lot of football life left in him, and we are riding his coattails! RT: Mexico are currently top of the North America, Central America and Caribbean World Cup qualifying group. How do you rate their chances of getting to the Russia 2018 next year? EC: Well I think our chances are really good, definitely really good, they started strong. One of our Achilles heels was the United States, playing for some time that was the biggest challenges in the CONCACAF for us - its US and Mexico, they're the two top teams. 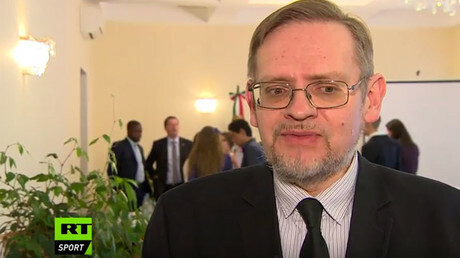 But we've got other teams like Costa Rica that has been playing really, really well, they're fairly strong, Honduras are strong, on any given day they can beat you. But one thing we've noticed with Juan Carlos Osorio is - with the average Mexican fan, you know we want results, just like everybody else - and Osorio for some strange reason, he'd demonstrated every single game he usually lines up with a different lineup every single game. That's kind of one of the push-backs that we've been having with his lineups is that there isn't a consistent 11 that he consistently goes to, there's always changes. It's almost like he's trying to find the right combinations and I get it it's a process and we've been fortunate enough, because at the beginning of the World Cup qualifiers, with where we're at now, we've been winning our games and we're top of the table so we're in a good place right now where he has that luxury to do that. But if times get tough and we start to struggle, the question now lies is who are our go to guys to go to. You talk to the average fan and they're going to give you Chicharito or Andres Guardado, [Jesus Manuel] Corona, [Miguel] Layun, who are playing at Porto, a lot of the European players - like Carlos Vela - those are the main guys [playing for] the European teams, those are the main ones that would be the ones that would be our go-to-guys. For some strange reason Carlos Osorio is kind of like I don't know what he's doing he's trying to mix and match and trying to find the right combination, I think the key for us is Guardado, we will continue to need his leadership. Marquez, this is going to be his last go-around. We definitely hope to see him in the World Cup, because we need his leadership and his experience in the World Cup and then we've got some great young guns like Jesus Corona who can create out of nothing, [Herving] "Chucky" Lozano, as well. Those are some main players that we really think could take us to the World Cup.